Can Anheuser-Busch InBev Really Afford To Increase Its Dividend? AB-InBev is under attack from craft brews, but it's about to give its investors a major pay raise. Anheuser-Busch InBev (NYSE: BUD) is facing intense competition. Most of the growth in the beer industry is going to smaller craft brewers. This has stoked fears that the best days for the industry giants, like AB-InBev, are in the past. But despite this, AB-InBev remains a cash machine, with massive scale and strong brands. The company's strategy was to pursue growth through acquisitions. Then, it drastically cut costs to expand margins. This proved to be a winning formula, as AB-InBev's steadily increasing cash flow has resulted in an increasing stock price. AB-InBev proved its cash-generating abilities on February 26, when it announced a huge increase to its capital allocation program. The company announced a $1 billion share buyback, and is raising its dividend by 46%, to $3.30 per share. That works out to a solid 2.6% dividend yield at its current stock price. Here's how AB-InBev can afford to shower a boat load of cash onto its investors. AB-InBev's core objective over the past several years has been to make large acquisitions, then cut costs to increase cash flow. First came the massive $52 billion deal that combined InBev and Anheuser-Busch in 2008. Two years ago, AB-InBev acquired the remaining portion of Groupo Modelo that it didn't already own, for $20.1 billion. These measures gave the company three global brands, Budweiser, Stella Artois, and Corona, that are the foundation of the company's massive portfolio. The result is that AB-InBev is a true industry giant. It now holds a huge portfolio of more than 200 brands. 16 of those brands each collect at least $1 billion in annual sales. In all, total sales have climbed from $36 billion in 2010 to $47 billion last year, representing 30% revenue growth over four years. After acquiring growth, the next step in the plan was to cut costs to significantly grow earnings. Indeed, AB-InBev's earnings before interest, taxes, depreciation, and amortization (EBITDA) grew from $13.8 billion in 2010 to $18.5 billion last year. 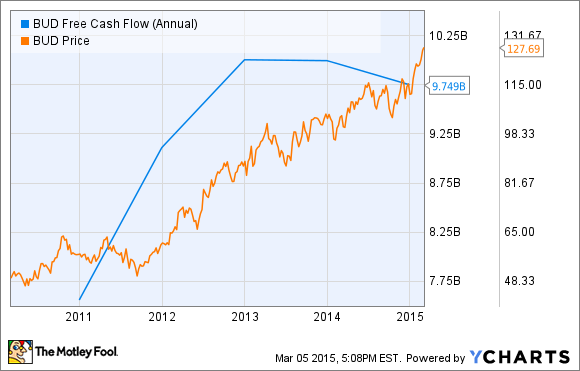 In the same time, free cash flow has soared, and now totals over $9 billion per year. As a percentage of revenue, AB-InBev's EBITDA margin has expanded by more than a full percentage point from 2010-2014, from 38.3% to 39.4%. This shows how effective the company was in simultaneously acquiring growth and cutting costs. There should be plenty of room for further sales growth, thanks to AB-InBev's huge global reach. The company continues to grow and capture share in high-growth markets. Brazil is particularly promising, because the company gained 30 basis points of beer market share there, reaching 68%. Furthermore, sales volumes grew 4% last year. Separately, thanks to its full ownership of Groupo Modelo, AB-InBev now holds the No. 1 position in Mexico, with a 57% share of the market. And, of course, there's the ironclad grip on the U.S. market. AB-InBev holds the No. 1 position in the U.S., and a 46% share. Looking forward, management is banking on growth in the emerging markets. For example, sales in Brazil are expected to grow by mid-to-high single digits. The company even sees improvement in the United States. Volumes in the U.S. should grow this year, after a 0.6% decline last year. This fuels management's decision to substantially increase its dividend and buy back more stock. Since revenue and EBITDA are growing both in its developed markets and in new parts of the world, AB-InBev is generating a ton of cash. It's got a lot of cash flow at its disposal, which is why shareholders are getting even more cash returned to them. Management has the confidence to send more cash to investors because growth is expected to be strong, particularly in the emerging markets. For example, sales in Brazil are expected to grow by mid-to-high single digits. The company even sees improvement in the United States. Volumes in the U.S. should grow this year, after a 0.6% decline last year. This fuels management's decision to substantially increase its dividend and buy back more stock. AB-InBev isn't too concerned about the threat of craft beers. It's growing and getting more profitable with each passing year, thanks to its strategic plan of acquisitions and margin expansion. This plan is working like a charm, and AB-InBev's shareholders are the big winners.